Mom Needs More Care Than You Can Provide - Have You Looked into Granny Pods? ← Can Exercise Help Your Aging Adult’s Brain Stay Strong? Mom Needs More Care Than You Can Provide – Have You Looked into Granny Pods? Home Care Services Oakland TN – Mom Needs More Care Than You Can Provide – Have You Looked into Granny Pods? Granny pods may have an unappealing name, but for a family caregiver, these senior-friendly tiny homes work well. Your mom refuses to consider assisted living, but she needs to downsize. Her home is too much for her to handle. Plus, the upkeep is burning through her life savings. A granny pod is an excellent solution in some cases. A MEDCottage, aka granny pod, is a small home that goes into your backyard. Your mom lives alone but within easy reach in case of an emergency. As she no longer has an expensive home to maintain, she can use the savings to pay for home care services. She’s getting the care she needs. You’re not stressing yourself out trying to handle family caregiving duties while holding a full-time job. Granny pods are a compact building, much like a garden shed, that offer a one-floor layout. The cottage has an open floor plan that includes a bathroom, living area, dining area, and bedroom. There’s no formal kitchen, but there’s room for a microwave or toaster oven and a small counter and sink. Some granny pods have special features designed to keep your mom safe. If she has a disease like Alzheimer’s, the HD monitors are essential tools for keeping her safe. She thinks she’s living independently, but she’s actually being monitored for safety when you turn the cameras on. In order to have a granny pod placed in your backyard, you do need to look into your area’s zoning laws. Most of these buildings are less than 300 square feet, so they’re not larger than many backyard sheds. Make sure that it will be possible to connect to your current leach field and septic system if you’re not on city sewer and water. If you have a well, the well’s water supply must be enough to connect and support another household. As your mom is living in your backyard, you’ll be able to have her dine with you. When you’re not home or need time to yourself, home care services help with the care she needs. 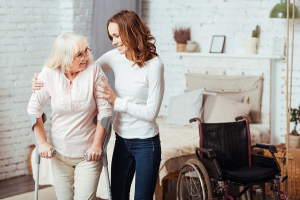 Have a caregiver come in to help your mom with transportation during the day, join her on walks, or help her with medication reminders, Home care services providers also provide cleaning services and companionship. Call our home care services agency to get answers to your questions or to learn more. For Home Care Services in Oakland TN, please contact the caring staff at Personal Care Services MidSouth today! This entry was posted in Home Care Services Oakland TN, Personal Care Tips and tagged Home Care Services Oakland TN. Bookmark the permalink.